As women age and enter different phases of their lives, such as pregnancy, breastfeeding, or weight gain or loss, they can notice changes in their body. Some of these changes are appreciated. Others aren’t. It’s normal for breasts to start to begin to sag. But just because it typically happens, doesn’t mean you need to live with these natural phenomena. Huntington Beach’s Dr. Vu of California Aesthetic Center can perform a breast lift surgery to help restore your breasts to their former, more youthful looking position. The top reason you should consider getting a breast lift is you. If you’re not comfortable and confident in your own skin because of sagging breasts, plastic surgery can help you regain your self-esteem and make you proud of the body you have. If you look in the mirror and feel like you don’t even recognize yourself, then Huntington Beach’s California Aesthetic Center can help. There’s no greater place to live than Huntington Beach! But if your breasts are sagging so much you feel like you can’t enjoy the beach or be bikini ready, you may want to consider surgical intervention. With a breast lift, your sagging breasts can be restored to a more youthful position, making it easier for you to be bikini ready, all year long. Let’s be honest. Everyone wants to look good naked, especially if they’re sans clothes with that special someone. But it can be hard to feel comfortable and relaxed in intimate situations if you are concerned about the appearance of your sagging breasts. A breast lift to restore your breasts’ position can help make you more comfortable when you’re alone with your significant other. If the appearance and sagginess of your breasts are causing you to feel down, then elective plastic surgery can help. 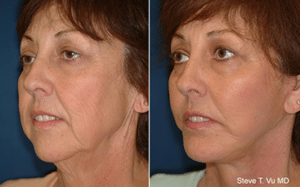 Huntington Beach area women can find caring, thorough plastic surgery services by Dr. Vu at California Aesthetic Center. If your breasts have already begun to sag, then Dr. Vu’s surgical intervention can help improve the way you feel in your own skin, make you feel ready for the beach all year long, and make you feel comfortable during those intimate situations. You just need to take the first step by reaching out to us. When you call California Aesthetic Center, you’ll be greeted by one of our knowledgeable staff members who will work with you to find a mutually convenient time for you to meet with Dr. Vu and talk about your concerns and desired outcomes. During this appointment and examination, Dr. Vu will create a personalized treatment plan for you and communicate what he anticipates your realistic results may be. To schedule an initial appointment with Dr. Vu, contact California Aesthetic Center today at their office in Huntington Beach. Call (714) 848-1133.